Crossbow shooting gallery. Sniper training. 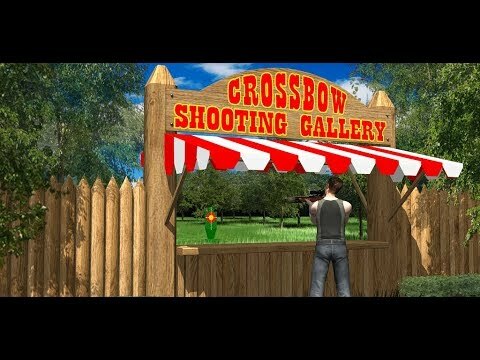 A game for true connoisseurs of weapons and in particular amateurs to shoot from a crossbow.This is not an arcade game, it’s a simulator of shooting from a throwing weapon – a crossbow.In the dash, you can practice shooting in of crossbow using three main types of sights.Mechanical sight:This type of sight consists of two parts, a front sight and rear sight.To accurately shoot it is necessary to combine a front sight with a slot in the rear sight.This is called alignment of the front sight. Keeping this mutual location of sighting devices it is necessary to combine the guns sight with the target and shoot.The most difficult to use type of sight.Collimator sight:This type of sight has a luminous aiming mark. Its color can be changed.For aiming, you just need to combine the aiming mark with the target and shoot.The sight is convenient when firing at moving targets.Optical sight:This type of sight allows you to change the amount of increase in the target from 3 to 9. The color of the illumination of the aiming grid can be changed.The sight is indispensable when shooting for long distances.There are four types of targets in the game:- A classic crossbow target.- Silhouette target.- The running boar.- The pendulum.When aiming, one must take into account the fact that the crossbow was adjustment shoot at a distance of 20 meters. At other distances, the arrow will fly below the aiming point. In addition, the boom is subject to drift by wind. Therefore, the direction and speed of the wind should also be taken into account when aiming. Shooting is conducted at distances from 20 to 90 meters. At each distance are given 10 arrows. When you earn 80 points you will get access to the next range. Distances must be passed with each sight individually.The target of the game is to pass all the distances and score maximum points.